LEADERSHIP is not a popularity contest, Northern Tablelands MP Adam Marshall told a group of young leaders from small schools in the Guyra district last week. Addressing the annual lunch of student leaders from Black Mountain, Guyra Central, Bald Blair, Ebor and Chandler primary schools, Mr Marshall urged the students to on occasion make the hard unpopular decisions that deliver the right outcome, rather than cultivating popularity with what might be a poor decision in the long term. The annual Primary Leadership Luncheon at Rafters brings together small and not-so-small primary school leaders from around the district. 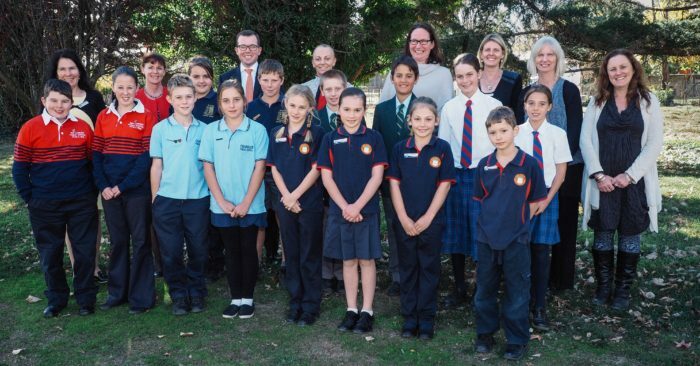 “The is an opportunity for student leaders across our schools to talk together about their leadership roles and their work in their schools,” said Black Mountain Primary School principal Belinda Baker. Mrs Sue Brown, the Director of Public Schools NSW, Northern Tablelands, joined the students and staff from the schools for the lunch.